Kasuga Gongen Genki E is a massive work from the dawn of the 14th century consisting of 20 scrolls in total featuring paintings by TAKASHINA Takakane, head of the court atelier, at the behest of SAIONJI Kinhira, Minister of the Left at the time. All of the scrolls have survived. The work is extremely valuable in terms of the history of Japanese paintings, and it features a style that is unrivaled in its elaborateness and resplendence. Currently curated by the Imperial Household Agency, the work is being completely disassembled and restored as a part of a 15-year plan that began in 2004. 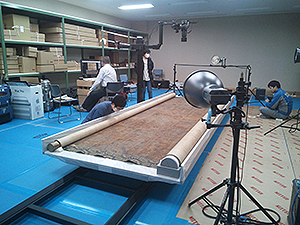 As part of joint research with the Imperial Household Agency, the National Research Institute for Cultural Properties, Tokyo has optically studied and photographed the work prior to restoration. As of last year, 12 scrolls of the 20 total scrolls had been studied. This year, high-resolution digital photography of scroll 4 and scroll 15 was done with visible light, fluorescence, and 2 types of infrared waves (reflected and transmitted). 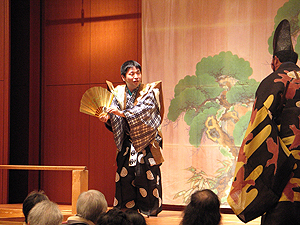 Photography took place from December 3 to 6, 2012 and involved SHIRONO Seiji, KOBAYASHI Koji, and KOBAYASHI Tatsuro from the Institute’s Department of Art Research, Archives, and Information Systems. From December 10 to 20, HAYAKAWA Yasuhiro of the Center for Conservation Science and Restoration Techniques used X-ray fluorescence of the 2 scrolls to collect data on paints. Use of the reams of data that have been obtained thus far will be examined with the Imperial Household Agency once conservation and restoration are complete. Growth of microbes causes substantial deterioration of cultural properties, regardless of whether they are outdoors or indoors. Memories of the Great East Japan Earthquake are still fresh. The effects of water damage can soon lead to microbial deterioration of cultural properties that have been damaged by a disaster like an earthquake or tsunami. Surveys to ascertain the extent of damage and countermeasures against that damage are crucial. 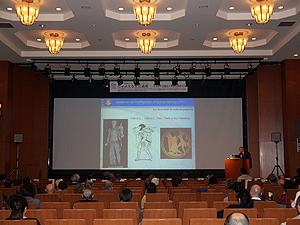 Thus, the Center for Conservation Science and Restoration Techniques hosted a symposium on the Microbial Deterioration of Cultural Properties at Heiseikan of the Tokyo National Museum from December 5 (Wed.)–7 (Fri.), 2012. Different departments of the Institute take turns hosting a symposium each year, and this year’s symposium marked the 36th International Symposium on the Conservation and Restoration of Cultural Properties. 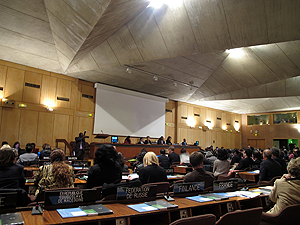 The opening day of the symposium featured two keynote speeches by foreign experts, followed by a session on the biodeterioration of disaster-damaged cultural properties. The second day of the symposium featured a session on the biodeterioration of stone monuments and wooden structures outdoors. 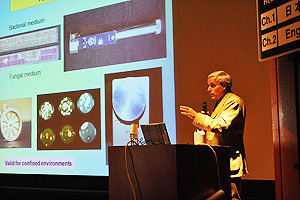 The final day of the symposium featured sessions on techniques to ascertain biodeterioration of cultural properties indoors and environmental factors for deterioration. 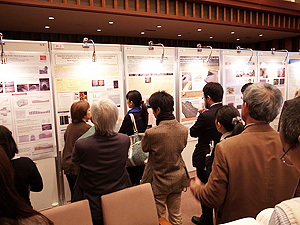 The 3 days of the symposium featured 15 lectures as well as 23 poster presentations by presenters from Japan and abroad. 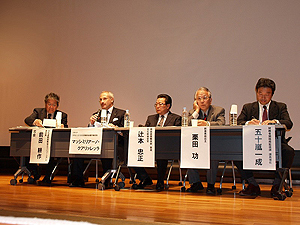 The symposium encouraged an active discussion among the 232 participants (421 participants in total). 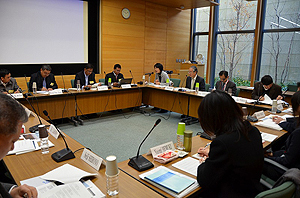 The symposium was attended by numerous foreign experts from countries such as Italy, France, Germany, Canada, China, and South Korea. Symposia on the specific topic of microbial deterioration of cultural properties are seldom seen, and many of the experts from Europe who attended did so at their own expense. 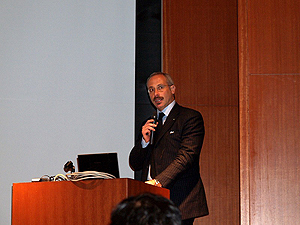 The symposium was truly an international symposium, allowing a substantial exchange of information. Sincere thanks are extended to the presenters and participants who enthusiastically collaborated with the Center for Conservation Science and Restoration Techniques.